March 1, 2019: With Kantu 4.0 we have merged the SeeShell and Kantu products into one. The new formular is: Kantu (old) + SeeShell = Kantu (new). All SeeShell PRO and Enterprise users received a free cross-upgrade to the corresponding Kantu Editions. If you did not receive the emails for any reason, please contact us. If you prefer to continue to use SeeShell for now, no worries. Tech support and documentation for SeeShell is still available until 2021. SeeShell creates rock-stable web automation with screenshots. At the same time, SeeShell is high-level and simple: a new user is able to automate their task within minutes of downloading SeeShell. SeeShell works on the visual image of desktop and websites, just like a human does. Leave class names, DOM, xpath, css selectors to the software developers. And even if you are a developer – SeeShell gives you a break while it tests your code. SeeShell is the Swiss-army knife of desktop automation and Robotic Process Automation (RPA). The SeeShell browser has the Google Chrome core inside (Chromium). So it is fully compatible with any modern website. The automation is visual, so there is no new scripting language to learn, you have full programmatic control over the web browser, and even the most complex tasks can be scripted. SeeShell’s powerful computer vision lets you automate and test websites using images instead of cumbersome element selectors or X/Y coordinates. You tell SeeShell how a button looks like and SeeShell finds it on the page. Even when the button has moved or if it has changed color or screen resolution. Since SeeShell relies only on the images that are rendered in the browser, it works independently of the underlying technology. For example, automated HTML5 canvas testing or flash testing is an either super-complex or outright impossible task with most tools, but with the SeeShell Browser it is a five minute project. SeeShell contains a command-line interface and application programming interface (API) to automate more complicated tasks and integrate with other programs or scripts. The Scripting Interface of SeeShell is designed as a Component Object Model (COM) object and allows the user to remote control (script) the SeeShell Browser from any Windows programming or scripting language. All this means you can access SeeShell’s web automation functionality from any programming language that supports COM. Developers using VBS, PowerShell, C#, Visual Basic, Python, Java and any other programming or scripting language that runs on Windows can embed and control SeeShell directly in their applications. For more information see the API page. In a nutshell: The SeeShell Community Edition is 100% free - even for commercial use. Get it now. The SeeShell Community Edition is free for private *and* commercial use. SeeShell is classic downloadable software, not a web service. All macros are stored and executed locally on your machine. 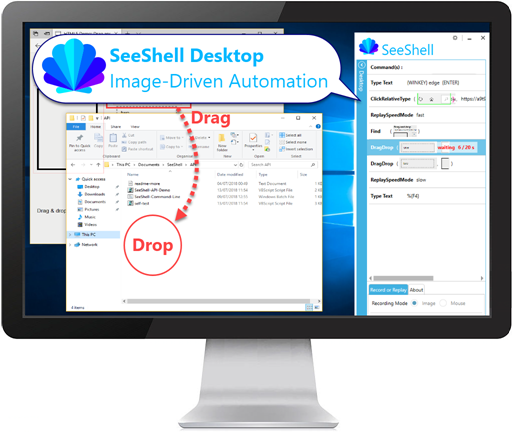 SeeShell PRO Edition: Do you plan to use SeeShell for complex automation projects? Then save yourself expensive development time and get the SeeShell PRO Edition. Its Scripting API allows you the control SeeShell from any programming or scripting language. And it does not cost much: In addition to the software itself, our prices always include one year of free updates and free priority tech support. Our tech support helps you with creating the image macros and scripts at no additional costs. For more information see the SeeShell comparison page. Next step: If you have not done so already, download the SeeShell Community Editions now.